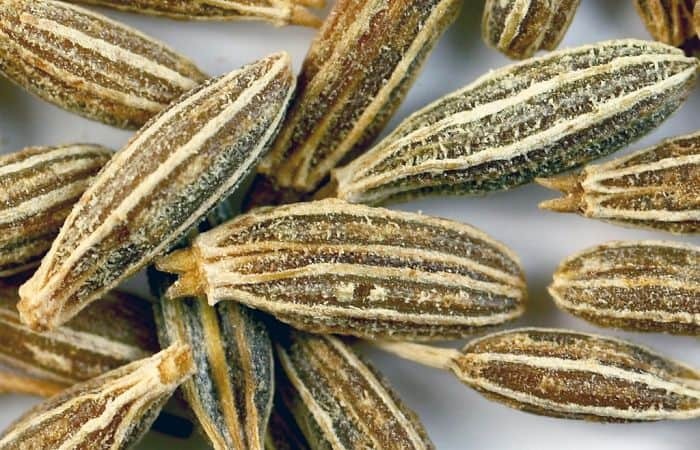 Cumin should not be confused with black cumin (Nigella sativa), a similar and closely related species from Pakistan and India with slightly larger and bent seeds. Other Common Names: Cummin, Roman caraway, Egyptian caraway, comino (Spanish), spisskummen (Norwegian), roomankumina (Finnish), Kreuzkümme (German), cumin de prés (French), zi ran qin (Chinese), spiskummin (Swedish), spidskommen (Danish). Habitat: The original habitat of cumin is not known, but it has been theorized that it could have its origins in the Nile valley and from there it spread to other countries in North Africa, Southwest Asia, East Mediterranean and all the way to India. The plant has been cultivated for thousands of years and today India and Iran are the biggest producers, but the herb is also cultivated in China, Indonesia, Sri Lanka, Pakistan, Turkey, Morocco, Egypt, Sicily, Malta, Cyprus, the southern parts of Russia and in Central and South America. Cumin grows best in subtropical or tropical climate. The plant prefers a deep, nutrient-rich soil in sunny locations. In warm countries, the seeds are sown directly into the ground in spring but where the climate is colder the seeds should be sown indoors in March in a warm place with plenty of light and if the weather is warm the plants can be replanted outside in June. In countries with the right climate, the seeds can be harvested from three to four months old plants. Hot and dry weather yields the best harvest. 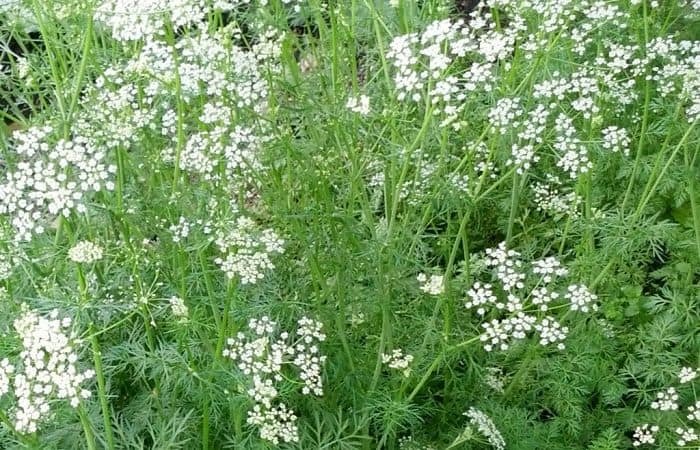 Description: Cumin (Cuminum cyminum) is an annual plant belonging to the carrot or parsley family (Apiaceae). It usually grows between 10 to 30 cm tall with completely smooth stems that are richly branched from the ground up. The stalks are thin and rather weak, often making the stalks of larger plants grow in a horizontal position on the ground. The leaves are blue-green up to 7 cm long and the flowers are small and white or light pink in color. The flowers are hermaphrodite (contain both male stamen and female stigma) and are pollinated by insects. The fruit (seed) is a 4-5 mm long and 2.1 mm wide, narrowly ovate schizocarp (a dry fruit that, when mature, splits up into mericarps). The seeds are similar to caraway seed, but slightly larger, not as curved and lighter brown. They are strongly aromatic and have a slightly bitter taste. Cumin plants can be very variable in terms of size, the number of flowers and color of the flowers and fruits. Plant Parts Used: It is the cumin seeds that are used in herbal medicine. Just before the fruits become ripe, the plants are harvested and threshed. The seeds are then dried in the sun. In many countries, the harvesting is still done manually. As a spice, the seeds are used whole or ground but they should only be ground just before use. Ground cumin seeds lose their flavor relatively quickly. To enhance the flavor of the seeds they can be roasted in a dry frying pan before use. Whole, dried fruits (seeds) can be stored for years in airtight containers stored away from light. Active Ingredients and Substances: The seeds contain 2.5% essential oil (composed mainly of cuminaldehyde (40-65%), with minor amounts of p-mentha-1,3-dien-7-al, p-menth-3-ene-7-al, γ-terpinene and other compounds. The composition of the essential oil differs substantially from the essential oil of caraway. In addition, the seeds contain flavonoids (including apigenin and luteolin glycosides), bitter substances, tannins, 10-15% fatty oil with a high concentration of petroselinic acid, sugars and proteins. 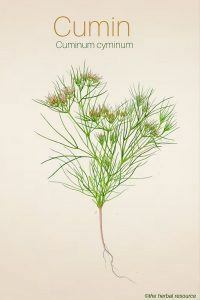 Cumin is a crop that was in use in the Mediterranean and the Middle East already in antiquity. The herb is mentioned in the Bible and also on Sumerian clay tablets. In the Egyptian Ebers Papyrus (written around 1550 BC) cumin is described as an ingredient in several of the Egyptian medicines, and the seeds have been found inside some of the Egyptian pyramids. Among Europe’s oldest cultures, it was highly valued as a spice and was e.g used as pepper substitute in ancient Rome. In ancient Greece, cumin symbolized extreme greed for wealth or material gain and it was said that avaricious people certainly ate cumin. The herb has been cultivated in Spain since the 11th century. Cumin was introduced by Spanish explorers to South America where it soon became very popular and has gradually become an important ingredient in Mexican cuisine. Cumin had a prominent role in the past as a medicinal herb and was used against a wide variety of ailments, such as jaundice, fever, lung diseases, nosebleeds, and menstrual pains. In the Middle Ages cumin was still greatly sought after in many European countries and it was discussed in Nordic medical books from the 13th and 14th century. The herb popularity as an herbal medicine has dwindled since then, but it still plays a vital role in Egyptian herbal medicine. The plant family Apiaceae contains many important medicinal and spice plants, and cumin has in the same way as its close relatives caraway (Carum carvi) and anise (Pimpinella anisum) anticonvulsant properties, and when used in tea form it seems to have positive effect on the digestive system and it is often used as a remedy for bloating accompanied with colic or diarrhea. Cumin stimulates saliva production, secretion of digestive fluids and excretion of bile, and additionally, it provides increased movement of the intestines, which generally improves digestion. Cumin may also be useful as an herbal remedy for irregular or infrequent periods when not related to an underlying disease. The seeds are sometimes used in tea form to increase the production of breast milk in lactating women, the same way as fennel seeds (Foeniculum vulgare). In some countries the seeds are thought to be helpful in relieving menstrual cramps and as an abortifacient agent. The essential oil of cumin is rich in vitamins A and C, making it a powerful antioxidant and thus a potential cancer-fighting herb. Studies on rats showed that cumin inhibited the formation of cancer tumors induced by a carcinogen. Studies also have indicated that an extract of cumin may have an estrogen-like effect. In another study where cumin was administered to healthy rats, it increased their glucose tolerance which indicates that it may have an anti-diabetic effect. The possibility that cumin can help to control or prevent diabetes in humans is still unknown and further and bigger studies are needed to investigate the herb’s usefulness in that regard. Externally, the essential oil of cumin mixed with a base oil can be used as a treatment for cellulitis. In Indian herbal medicine cumin is used to treat insomnia, colds and fever, and mixed together with onion juice it is applied in paste form on scorpion stings as a relief. The cumin seeds are used as a spice, either whole or ground. It is often recommended to roast the seeds on a frying pan without fat or oil before use. When the seeds are exposed to high temperature they release compounds called pyrazines, which provide a richer flavor to the dish. Cumin is a popular spice particularly in northern Africa, India, Indonesia, Thailand, Malaysia, Mexico, the southern United States, Turkey, Spain, and Portugal. In North Africa, cumin is an essential ingredient in couscous. In India few varieties of cumin are used, where the most common are “safed” (white) and “kala” (black). Cumin is responsible for the distinct spicy and slightly bitter taste of curry powder, where the herb is an essential ingredient along with coriander (Coriandrum sativum), chili pepper (Capsicum frutescens) and turmeric (Curcuma longa). The seeds are also used in other spice mixtures in Pakistan and India such as garam masala, and it is partly responsible for the characteristic taste of falafel. The combination of ground cumin and coriander gives a lot of Indian food its distinctive scent. Cumin is also an important ingredient in traditional North African lamb fricassee and couscous. Cumin is widely used in South American cuisine and where it is also an important ingredient in some chili powder mixtures. In Europe, it has been used to a lesser extent but still, it has been gaining popularity in recent years. Increased interest in both Indian and Mexican cuisine in Northern Europe, has meant that this previously little-known spice is now found on the shelf of nearly every grocery store. In the Netherlands and Switzerland, it is an important spice in some cheeses and it is also used in some pastry recipes and it gives a spicy flavor to varieties of biscuits and cakes. Cumin has also been used as an ingredient in sausage making and it can be a great addition to some soups, sauces, and vegetable, fish and meat dishes. The taste of the herb is fairly pervasive, so it should be used sparingly. In combination with other herbs cumin fits well with bay laurel leaf, cardamom, chili, cinnamon, cloves, garlic, ginger and nutmeg. The appropriate dose of cumin as an herbal medicine may depend on factors such as age, health, and several other conditions. It is recommended to consult a trained and licensed herbalist or other professional healthcare providers with regard to dosages and doses. For commercial products containing the herb, the manufacturer’s instructions should be followed. Based on existing data, there seems to be no danger of toxicity when cumin is used as seasoning. Allergic reactions to the herb can occur in people who are allergic to other species in Apiaceae family (anise, caraway, carrot, celery, fennel and parsley) or the Asteraceae family (mugwort). If the herb is prescribed by an experienced herbal therapist, it should not be used in medicinal doses during pregnancy. Before using the herb as herbal medicine to treat gynecological ailments, the condition must be evaluated by a healthcare professional. Cumin should be avoided by those suffering from estrogen receptor positive (ER+) tumors. Otherwise, there are no reports of contraindications or side effects when the herb is used properly. van Wyk, Ben-Erik: Culinary Herbs & Spices of the World. Kew, Kew Publishing, Royal Botanic Gardens 2014.Williamson, Elisabeth M.: Potter’s Herbal Cyclopedia. Essex, Saffron Walden 2003.